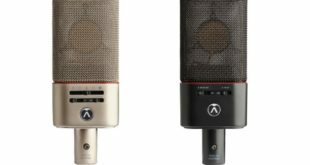 Microphone preamplifiers – both professional and consumer – often supply a DC voltage back over the same wires that carry the audio in order to power the circuitry in condenser microphones. Often, when testing microphone preamplifiers, this DC voltage is either just turned off or ignored. Unfortunately, this means the tests are not being done under actual operating conditions, which may obscure problems or produce inaccurate results. 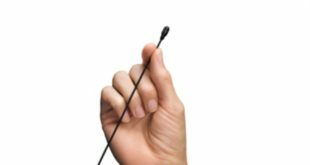 This article describes a fixture you can make to enable testing of both the microphone power itself and the audio, where the power supply is given a real-world load. 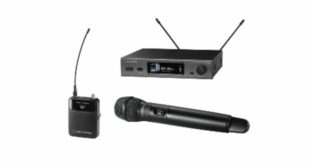 Microphone preamplifiers include standalone devices, audio mixers and the input circuitry incorporated into any device that incorporates or accepts a connection to a microphone. In balanced connections, found on professional and semi-pro equipment, the most common condenser microphone powering system is 48V phantom power. The fixture shown in Figure 1 is designed to test this type of power. Unbalanced connections, found in consumer equipment, often use ‘Plug-in power’ or similar variations. The principles and techniques here can be adapted to that as well. Careful attention to construction and component quality is necessary to avoid sensitivity to EMI, which could degrade the accuracy of noise measurements. The test fixture has four main features: Coupling capacitors (CB) block the DC phantom voltage and prevent it from being loaded down by the generator; load resistors (RL) draw 10 mA (the minimum required to meet IEC specifications) from the phantom supply; series resistors (RC) allow the audio source impedance to be accurately set; jacks J2 and J3 allow measurement of the phantom voltage presented to the microphone. Resistors compensate for the effect of load resistors, to maintain the rated generator output impedance, and also serve to add additional output impedance to signal generators that do not have the desired output impedance setting. Discharge resistors (RD) are added to provide a path to ground for the phantom voltage when the generator is not connected to the fixture. Note that CB and RL form an RC circuit, which will roll off low frequencies. The value chosen for CB is large enough to keep response extremely flat at 20Hz, and to not interact with the RC filter already internal to most microphone preamps for blocking phantom power from reaching the input stage. When measuring microphone preamplifiers, the source impedance of the audio generator must be carefully set, or else the noise measurements will be invalid. This is for two reasons: the thermal noise produced across the source impedance determines the lowest noise level that can be achieved; and input circuit noise performance is affected by source impedance. The standard source impedance for testing and producing specifications for balanced microphone preamplifiers is 150 ohms. Many condenser microphones, however, especially those with ultra-low self-noise (3–14dB SPL), have very low output impedances on the order of 25 to 50 ohms Performing additional testing using a 50-ohm source impedance, even though it isn’t a standard, may give results that better represent actual usage. Unbalanced microphone inputs are tested with either a 150 or 600-ohm source. With semi-pro gear, such as portable digital recorders, unbalanced inputs are normally tested at 150 ohms, while consumer grade gear such as computer sound cards are often tested at 600 ohms. If the preamplifier under test is to be used with an internal microphone then the source impedance should be set to mimic the actual operating conditions. Phantom power is fed onto the audio conductors through two 6.8 kiloohm resistors, which limit its current and prevent it from loading down the attached microphone. The phantom power with no load should measure 48.0 VDC (±4.0 VDC). Some budget devices are labelled as being capable of supplying phantom power, but use non-standard voltages that do not meet the IEC P48 phantom specification. These devices often derive microphone power from an available power rail inside the unit, and do not have a dedicated 48V supply. Figures 2 and 3 show the results of testing two different microphone preamps. The phantom voltage is measured at a spare microphone input channel (use the special cable shown in Figure 6). Even though we are measuring through the 6.8 kiloohm resistors, the high input impedance of the analyser ensures that the voltage drop across them will be negligible. If the DUT has only one microphone input channel, then this measurement can be made by removing the test fixture or removing the load. As can be seen, the first preamplifier meets IEC specifications, but the second one doesn’t. A 10 mA load is now added by connecting the test fixture. The display shows the phantom voltage measured as above, along with the voltages measured at the test fixture on the balanced audio lines of the preamplifier input channel under test. When drawing 10 mA from the phantom supply, the voltage measured on the audio lines (after the drop across the 6.8 kiloohm phantom power resistors) should be 14.0 VDC. Again, the first DUT passes, but the second one fails. Not only is the voltage low overall, but the phantom supply itself has dropped from 37.44 to 17.96 VDC under the 10 mA load. This test also lets us check that both pin 2 (HI) and pin 3 (LO) of the audio cable are supplying the same voltage. A difference between them might indicate a fault in one of the 6.8 kiloohm resistors or its associated signal path. Some additional measurements should be made to check if there are any changes in the phantom voltage with or without audio signal, and also if there are any changes in audio performance when the phantom power is turned on or off. These particular measurements should be done at a high gain setting, such as 70dB, to make any differences more visible. 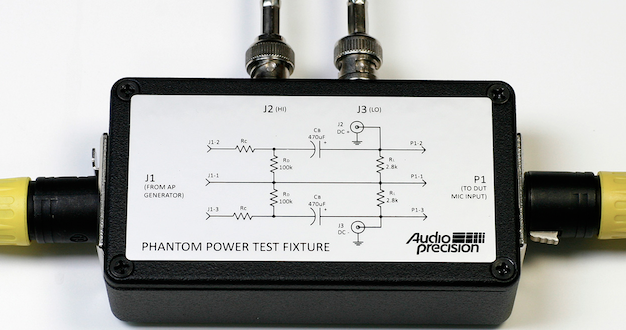 Now that the phantom power supply has been checked out, you can proceed with a full suite of standard mic preamp audio tests, leaving the fixture attached in order to maintain the proper phantom supply load and audio source impedance. Adam Liberman is technical support engineer at Audio Precision. 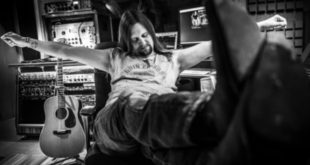 His broad range of experience includes film & TV production and post-production sound; theatrical sound design; radio production and engineering; computer audio testing and reviewing; music and nature sound recording; and test, repair, and modification of pro-audio and film editing equipment.